The piracy icon - Popcorn time, the increasingly popular torrent-streaming platform, made a surprise comeback with "Hail Hydra" on Feb 25, 2016 according to Torrentfreak, which seems to turn Hollywood's short sweet dream into a nightmare again. If this is true, movie lovers will stream new and still-in-theaters films to their mobiles easily with Popcorn Time iPad iPhone Android app. Does this mean Popcorn Time alternative is needless anymore? Hold on. For movie studios, this is an unhappy return and MPAA will take part in it, at least the past events prove their stance. - On March 14, 2014, Popcorn Time developers abruptly shut down the program, due to the pressure of MPAA. - In October 2015, YTS, one of movie torrent download sites, has shut download, possibly permanently, along with PopcornTime.io, after the threat of a multimillion-dollar lawsuit from MPAA. - On Nov 20, 2015, Popa.cr, an alternative to Popcorn Time, received an MPA notice hours after going online on Reddit. It seems to be an never-ending whack-a-mole game. If you are tired of the murky PopcornTime, but need to watch movies at your disposal without waiting till the return of piracy icon, you need a helpful and trustworthy Popcorn Time alternative for iPad iPhone Android to download free and informed of the valuable news regarding to the secretive Popcorn Time. Popcorn Time is a cross-platform, free and open source media player that streams copyrighted videos and movies via torrents in real-time, without the hassle of downloading them first. Made available for Linux, Mac OS X, Windows and Android, Popcorn time is intended as a free alternative to movie streaming services and even delivers a greater movie streaming performance than Netflix due to its ease of use. On March 14, 2014, Popcorn Time was abruptly removed as a result of the copyright issues but regains its reputation on May 13 with Popcorn Time Android app release as users of the Popcorn Time Android app are now able to watch TV shows and movies on a wide range of Android-based devices, especially since August 7. Stream Movies to iPhone iPad Android with PopcornTime App Illegally? No.1 fast video converter allows you to download full-length movies from YouTube, Dailymotion, Metacafe and alike sites and convert the downloaded movies to PC, Mac, iPhone, iPad, Samsung, HTC and other Android devices for watching offline without Popcorn Time App. The torrent-streaming platform Popcorn Time has received a strong word-of-mouth buzz as it not only helps to watch the latest movies from torrent sources without paying anything that Netflix cannot do but also leaves us deep impression for its spot-on subtitles and flawless quality of the video streaming. However, you may sometimes need a Popcorn Time replacement as it is still far from perfect in the following Popcorn Time not working problem, like loading error, black screen, not downloading movies, etc. 1. Bandwidth Issues: Since Popcorn Time is still in beta, it is far from stable and easily subjected to errors, most commonly reported are: 10 to 15mins delay in video streaming, the lack of support for advanced audio codecs and jittery video playback caused by server and bandwidth issues. 2. CPU Problem: Some users reported that the CPUs worked overtime while playing movies, shows and movies ascending or descending are unavailable to sort according to Softpedia. So you are suggested to download movies for offline watching instead of taking up your CPU a lot by using a Popcorn time alternative. 3. 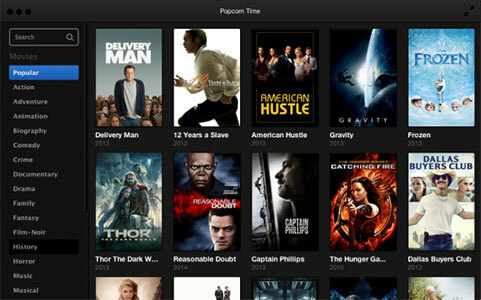 No Popcorn Time for iPad iPhone: Popcorn Time is now available for Android users, but Time4Popcorn seems to fail to cater to iOS users' movie watching needs right now, though some rumors suggest it will soon release a Popcorn Time iPhone/iPad app. So Apple users will need to seek for an alternative Popcorn Time running on iPad or iPhone, especially the newly released iPad Pro and iPhone X. 4. Copyright Issue: While the torrent-streaming platform Popcorn Time already has the movie industry quaking in its proverbial boots, it also brings the filmmaking copyright issue to the top of the headlines, especially when the law enforcement officials have been emphasizing on it right now. Even though the service came back again, it also indicates the end is nigh and the copyright police is on the trail again. Accordingly, to download an alternative app to Popcorn Time without defying legality is must-have. Since Popcorn time somehow disappoints us, people may pay for a good deal of money on Netflix for the top-notch blockbusters, or switch to download pirated movie content from torrent sites at the risk of falling foul of copyright laws or suffering from virus on their computers after torrent download. As a matter of fact, these are not really the Popcorn Time alternative solutions. You can just free enjoy movies or TV shows, with no legality issues, with the true Popcorn Time iPad iPhone alternative, called MacX YouTube Downloader. Not only you can free download HD videos, full movies, TV shows, etc from YouTube in 4K ultra HD, 1080p and 720p at fast speed and high quality, but also it's unnecessary to worry about ads, malware or spyware. The equivelence to Popcorn Time worth your download free also lies in that it also serves as a Popcorn Time iPad iPhone app because it can help to freely download YouTube MP4 videos and automatically add the MP4 files to iTunes Library for you to watch the movies on iPhone (iPhone XR/Xs/Xs Max/X/8/7/6s), iPad (iPad Pro, iPad Mini 4/3/2, iPad Air 2), iPod (iPod Touch 5) offline. - click "Download Now" to start freely downloading movies from YouTube as well as other movie/music sites like Dailymotion, Yahoo video, Google video, Vevo, etc. The above mentioned Popcorn Time replacement works well on MP4, FLV, WebM and 3GP compatible devices. 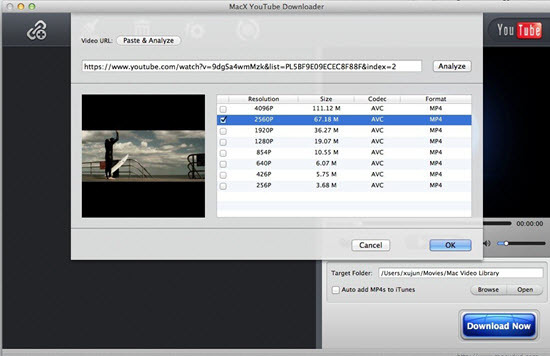 But for a direct movie playback on portable devices solution, MacX Video Converter Pro is second to none as it integrates both online video downloader and video converter, allowing movie buffs to not only download YouTube videos but also convert videos to 420 more latest devices, including iPhone Xs, iPhone XR, iPhone Xs Max, iPad Air 2/Mini 4, iPad Mini Retina, Samsung Galaxy S9 (Edge)/S8, Note 9, PS4, Surface Pro, etc. The movie downloading and converting process advances to be the world's no.1 fast and CPU usage is spared for other tasks, due to the support of hardware encoding technology. There are still many other alternatives that we will share with you so that you may care a hang. PlayBox - An easy-to-use movie and TV-show streaming app serving as a Popcorn Time alternative for both iOS and Android users to download and install without jailbreak. Showbox - Another famous app working as an alternative to Popcorn Time that you can stream late movies to Android at you will. However, it doesn't function well with less features than Popcorn Time apps and you cannot download Showbox from Google PlayStore. Moviebox - An iOS-based alternative app to Popcorn Time that is similar to Showbox. Due to the copyright infringement, you can neither download this app from Apple Store.